Universidade Federal de Viçosa, Programa de Pós-Graduação em Botânica, CEP 36570000, Viçosa, Minas Gerais, Brasil. Universidade Federal de Viçosa, Departamento de Engenharia Florestal, Laboratório de Restauração Florestal, Viçosa, Minas Gerais, Brasil. Universidade Federal de Viçosa, Departamento de Engenharia Florestal, Viçosa, Minas Gerais, Brasil. The Amazon is one of the most important tropical forests in the world, providing important goods and services to society. However, these forests are threatened by land use change. Deforestation and forest degradation are the two drivers that significantly contribute to both carbon emissions to the atmosphere and loss of biodiversity. Although there are alternatives to reduce emissions from deforestation and forest degradation, there is still little research on methods for assessing and monitoring the relationship between these processes and biodiversity (REDD+), as well as the impacts generated by the socioecological system on the stability and recovery of ecosystem services. With this review, we aimed at (i) describing the relationship between biodiversity and ecosystem functioning; (ii) analyzing the possible synergistic impacts of biophysical and anthropogenic predictors of deforestation; and, consequently, (iii) proposing the integrated implementation of REDD+ strategies in the Amazon basin. To increase REDD+ efficiency in the Amazon, it is essential to simultaneously evaluate the socioecological and biophysical predictors that directly affect the current and future demands for ecosystem goods and services. Accordingly, it is important to estimate the magnitude of multifactorial effects of deforestation predictors for the integration of REDD+ actions. Such estimations should be made through the rehabilitation of degraded lands with successional and permanent agroforestry systems, as well as with the application of different restoration methods. VILLA, Pedro Manuel et al. Predictores antropogénicos y biofísicos de deforestación en la Amazonía: hacia la integración de actividades REDD+. BOSQUE, [S.l. ], v. 38, n. 3, p. 433-446, nov. 2017. ISSN 0717-9200. 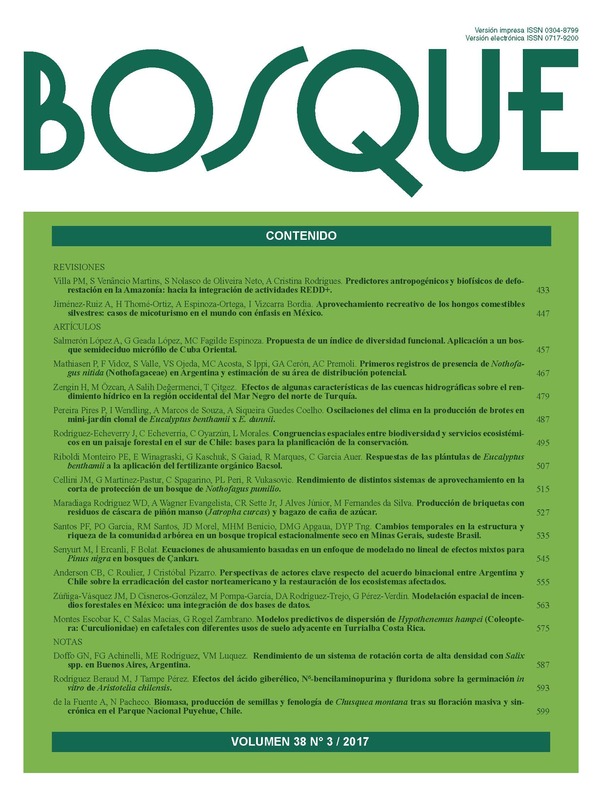 Disponible en: <http://revistas.uach.cl/index.php/bosque/article/view/820>. Fecha de acceso: 22 apr. 2019 doi: https://doi.org/10.4067/S0717-92002017000300001.